If you don't like the thought of a naked flame, battery operated taper candles might be just the solution to your lighting needs. Candlelight is wonderful for adding ambiance and atmosphere to a room or garden. However, for many people, it is just not a feasible option. Lit candles can be a safety hazard. If you have pets, they may unwittingly knock into a candle and tip it over. The wind may cause a candle to smolder. Young children might also brush against a candle and burn themselves or catch their clothing alight. These concerns have stopped many families from using candles. Fortunately, there is an excellent alternative available. Many people are turning towards battery operated candles as safe and attractive home accents. What are Battery Operated Taper Candles? Unlike traditional taper candles which are created from wax and wick, battery operated taper candles are made from plastic or glass. A battery operated candle is designed to look like a traditional candle, but the flame is replaced by a battery operated light. 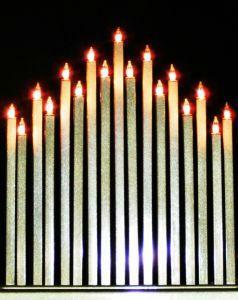 Some battery candles have a flickering light that replicates the movement of a natural flame. Battery taper candles are ideal for many purposes. They are perfect for indoor and outdoor use. These candles are often used to decorate a house at Christmas or to add festive ambiance to a dining table. Taper battery operated candles are not made from wax and do not melt. Therefore, there is no need to worry about molten wax dropping onto furniture or furnishings. Battery operated candles do not have any wires. The fact that they closely resemble conventional candles also means that they can be used in candle holders. The candles run off standard sized batteries. The batteries give many hours of use, with some manufacturers quoting a running time of over 400 hours from one set of batteries. Parties - Battery candles are safer to use at parties as they are less likely to be a fire hazard if they are knocked over. They are particularly well suited to parties where there is a lot of dancing or young children. Enclosed rooms - Even the most efficient conventional candle will generate some smoke. This can make the atmosphere unpleasant in an enclosed space. Battery operated taper candles do not give off smoke and are therefore a good alternative for use in small spaces or enclosed rooms. Unsupervised areas - Battery candles do not need to be supervised and can be left unattended for periods of time. This makes them ideal for use at Christmas when they can be 'lit' and placed in a window without the worry of them being a fire hazard. Dorm use - Many dorm rooms look great with a candle or two. However, conventional candles are often prohibited. Battery operated candles can be used safely. Solutions - This candle switches itself on and off automatically and the batteries last for over 50 days of use. Oriental Trading - This company offers a range of flameless taper candles, including a Halloween version. Plowhearth - This windowsill candle has light sensors, which means that it switches on at dusk and off at dawn. Battery taper candles offer you the perfect opportunity to enjoy candles and candlelight without the worry associated with a naked flame. They offer all the benefits with none of the mess!